Tamera Richardson aged out of the foster system on her eighteenth birthday. Forced to separate from the younger siblings she had cared for since she was seven years old, Richardson became homeless; sleeping in nearby parks and surfing couches, eventually moving into her car. Despite working at three jobs, Richardson continued her education, taking a full course load at a local community college. Though she was determined to succeed, her grades began to suffer. But in April 2009, Richardson enrolled in a program that, she said, saved her life: the Transitional Housing Program, also known as THP-Plus, which provides services to help former foster youths continue in school and live independently. The young woman who had spent most of her life “mothering” her brother and sister finally could focus on herself. “Recently—only about six months back—I finally realized what it is to be my own age,” Richardson reflected. Unfortunately for her and approximately 1,400 other California youths who were formerly in foster care, the state may cut all funds for the Transitional Housing Program. As one social services official described the looming threat, it ushers an era of “fear and loathing” among the state’s foster youth. In 2001, the state legislature created THP-Plus as a way to ease the transition from dependency to self-sufficiency, by providing housing for emancipated youths up to 24 years old. Individuals are referred to the program from the county’s Department of Social Services’ Independent Living Program, and may be provided apartments purchased through state Emergency Housing and Assistance Program Capital Development (EHAPCD) funding. The services provided through THP-Plus-approved nonprofit organizations go beyond housing. Besides personal and career counseling, there’s financial training, for example. While enrolled in the program, youths are required to pay rent and utilities, but the money goes into interest-bearing trust accounts established in their name. As an incentive, the organization matches up to $100 in additional savings per month. According to Lauren Burleson, Community Affairs Coordinator for the Family Care Network (FCN), the nonprofit organization that’s the main provider of THP-Plus services on the Central Coast, the goal is to accustom emancipated youths to paying bills and provide financial security so they can take the reigns when they leave the program. There are currently more than 500,000 children in the United States foster care system, a fifth of whom live in California. Every year, approximately 25,000 foster youths age out of the system nationally when they reach legal adulthood. In California, the number is roughly 4,500. Statewide, THP-Plus operates on a $36 million annual budget, according to Department of Finance records. It costs FCN approximately $2.3 million per year to provide transitional housing services, including those of THP-Plus. “THP-Plus is a program that we’ve never come out in the black; it’s always in the red,” FCN CEO Jim Roberts told New Times. The program survives, he said, on community support. Recent private donations from the California Wellness Foundation, Sempra Energy, and a core of devoted anonymous donors allow the FCN to provide specialized services to youth beyond what state funds permit. The national statistics are grim regarding adults who had been foster children. According to studies compiled by the Anne Casey Foundation, a Maryland-based childrens’ services nonprofit, 46 percent of foster children in the U.S. fail to complete high school and 56 percent of young adults staying at federally funded homeless shelters had been foster children. In fact, three of every ten people in the U.S. who are homeless are former foster children. More than half of all former foster children can’t find a job by age 22. The median annual income of young adults two years after they leave foster care is only $4,478. Almost half of the youth who had been raised by foster families have trouble securing health care and 42 percent become parents within four years after leaving foster care. Moreover, according to the foundation, nearly half of the youth exiting foster care had been provided mental health services but only 21 percent could continue. More than 30 percent said they sold drugs or became prostitutes, and 41 percent reported being arrested as an adult. According to the report, compared with youths who exited foster care without support, those with support up to age 21 are three times more likely to be enrolled in college. Those supported to 21 are 30 times more likely to be covered by health insurance, 50 percent less likely to become substance abusers, and 20 percent less likely to suffer mental disorders. According to the UW study, former foster youth supported to 21 are 65 percent less likely to be arrested, and 50 percent less likely to be incarcerated than those who lack support. According to figures from the California Legislative Analyst’s Office, the estimated cost of incarcerating an adult in fiscal year 2009-2010 is $45,044. When Governor Arnold Schwarzenegger unveiled his proposed budget for 2010-2011, it included a “trigger” list: programs that face a scale-back or total elimination unless the state is able to secure $6.9 billion in federal funding—a sum unlikely to arrive. The complete elimination of THP-Plus is on the list. The Child Welfare Services budget, from which transitional housing services are funded, took an $80 million hit in last year’s budget. Even if THP-Plus survives, if those funds aren’t restored, transitional housing programs would still face severe reductions. What health and human services officials don’t want to see is a return to the days when youngsters who weren’t lucky enough to have foster parents who could provide for them without state support were sent packing with nowhere to go. 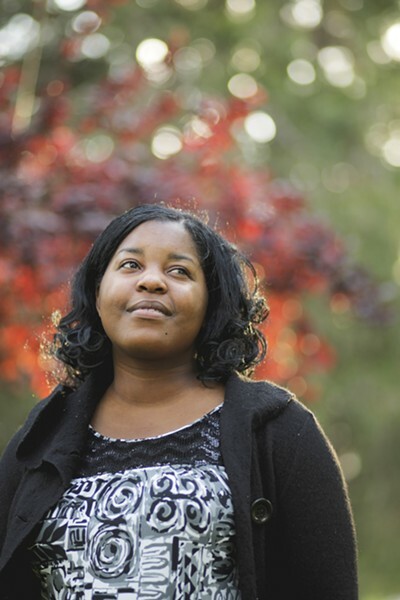 SUCCESS STORY : Tamera Richardson credits THP-Plus for helping her rise from homelessness after being aged out of foster care: “Without it, I would have had to put my dreams on hold,” Richardson said. “We are just beginning to make some progress and now we’re looking at turning the clock backward,” said Amy Lemley, policy director for the San Francisco-based John Burton Foundation, a nonprofit founded in 2004 by retired Senator John Burton, which provides advocacy and technical training to counties operating a transitional housing program. Candidate for SLO County Sheriff Mark Adams knows first hand that without a stable living situation, young adults are at risk for frequent contact with law enforcement. Adams has been a deputy with the Sheriff’s Department for more than 20 year and is a former foster child. “My living in foster care has definitely shaped who I am,” Adams told New Times. “I am a true product of the County of San Luis Obispo. Very, very much so.” Entering foster care at the age of nine, Adams by his own admission was “an out-of-control kid,” and had already spent time in juvenile detention. A caring foster couple was instrumental in helping Adams focus on school and sports, and eagerly maintained a home for him after his high-school graduation; transitional housing programs had yet to exist. Adams said he therefore clearly understands the value of such programs as THP-Plus. “Eliminating transitional housing for those foster kids means that they’re just going to end up on the street, and having to deal with life on their own. And some of them will be ready for it, most of them won’t,” Adams said. “And that’s going to send them down the long road, coming time and again into contact with law enforcement. Today, Tamera Richardson is enrolled full time at a local community college, majoring in psychology. She hopes to become a clinical social worker and has her sights set on earning a PhD at Stanford with the goal of establishing her own clinic or life skills program for men and women released from prison. According to a number of social services and child welfare officials, Richardson is not alone: Some foster children in their late teens are already reacting to the threat, reportedly dropping out of high school to look for jobs. “There have been some rumblings through our partners that some kids are getting panicky,” Roberts said. “It’s a political game, and an unfortunate one,” said Lee Collins, Director for the SLO County Department of Social Services, who’s a vocal critic of the governor’s trigger cut. In mid-March, the State Senate Budget Subcommittee on Health and Human Services held several hearings to discuss potential impacts to the Department of Social Services from proposed cutbacks. Officials from FCN, the John Burton Foundation, and the County Welfare Directors Association joined more than 20 THP-Plus participants in Sacramento to testify, with budget analysts from the governor’s office watching from the front row. The subcommittee rejected the governor’s budget proposals in a unanimous motion. Leno later told New Times he was amazed by the courage of the youth who spoke, and pledged to fight cuts to social services. “THP-Plus has been a great success,” Leno said. “We know that by helping stabilize emancipated youth we can help them succeed in their employment, keep them away from homelessness, and help them become productive taxpaying citizens. “It’s just pennywise and pound foolish to suggest that there will be any significant savings to the state by kicking these kids to the curb,” Leno said. The governor’s budget revision is due in May, and changes will in part depend on state income tax returns. So far, all indications point to the state seeing a slight bump in tax revenue, which could be a lifeline for THP-Plus. And Assembly Bill 12, which passed easily through the State Assembly and would secure federal funding for extending foster support until age 21, currently sits in the Senate. Such local nonprofits as FCN perpetually need private donations, which can be made in person or by calling their offices in San Luis Obispo, Santa Maria, or Santa Barbara. And volunteers are welcome. In honor of National Child Abuse Prevention Month, Family Care Network is holding its seventh-annual Miracle Mile for Kids on Saturday, April 17. More than 2,000 walkers and runners of all skill levels are expected. The 6.2-mile course starts at Morro Rock and continues along the shore to the Cayucos Pier. The event will kick off at 8:30 a.m. Register at fcni.org.